In the neighborhoods hit by April's tornadoes in Arlington, where debris was once scattered, the pieces are being picked up and the city wants to make sure progress continues. "It's still an ongoing process," said City of Arlington spokeswoman Rebecca Rodriguez. "When you look at the whole scope of the damage we're really doing very well." But for some Arlington home owners, progress has been slow. "You don't realize how slow it can be" said Donna Donaldson, whose home was severely damaged by the storm. "We feel very fortunate because although we've been out [of our home] for 103 days, there are other homes that haven't even been touched." Code enforcement officers are working with homeowners to make sure repairs keep moving along -- going door to door, making phone calls and writing letters to make sure progress doesn't stall. "It's to everyone's benefit to have every property remediated, every property either removed or restored, and that's the goal here," said Rodriguez. But with so many homes needing repair, resources are spread thin. "It's a huge headache," said Linda Horton, who was forced out of her home after the city deemed it unlivable. 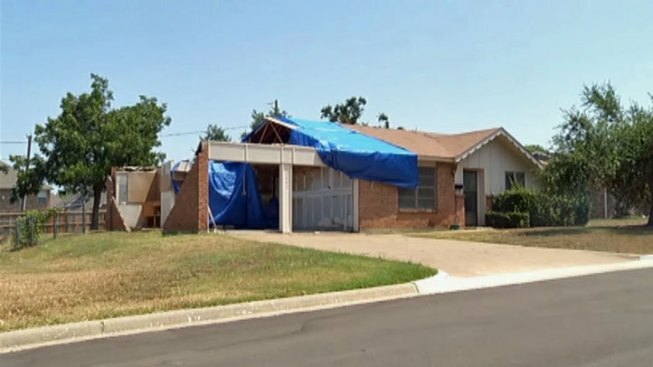 "You just can't imagine dealing with the insurance companies, the adjusters, contractors and trying to get things done, it's just such a slow, slow process." The City of Arlington says there are still three homes that remain abandoned and the city has been unable to contact the property owners.